Updated on Wed, 31 Aug 2016 18:53:17 GMT, tagged with ‘tech’. I’m not very familiar with the aviation jargon (see FAA’s ADS-B FAQ), but ADS-B is a next-gen system where aircraft are equipped with transponders that periodically broadcast their own positions and receive the reports from both other aircraft (direct air-to-air) as well as air-traffic control (ATC) ground transmitters. There are two separate ADS-B radio bands: the commercial aviation (CA) is at 1090 MHz while the general aviation (GA) is at 978 MHz. If I can be permitted a gross generalization—the former corresponds to big commercial jets and the latter to small private aircraft. Because ADS-B is designed to democratize airspace situational awareness (in contrast to the older setup, like from films, where a central air-traffic controller is coordinating all these aircraft that can’t see each other), we can buy cheap RF receivers to pick up and decode the messages being broadcast by aircraft and ground towers to get our own picture of the local airspace. This rabbit hole actually goes quite deep: FlightAware.com has built a business on crowdsourced ADS-B receivers. They will give you a networked ADS-B kit called FlightFeeder, for free, if you live in an area of sparse coverage. 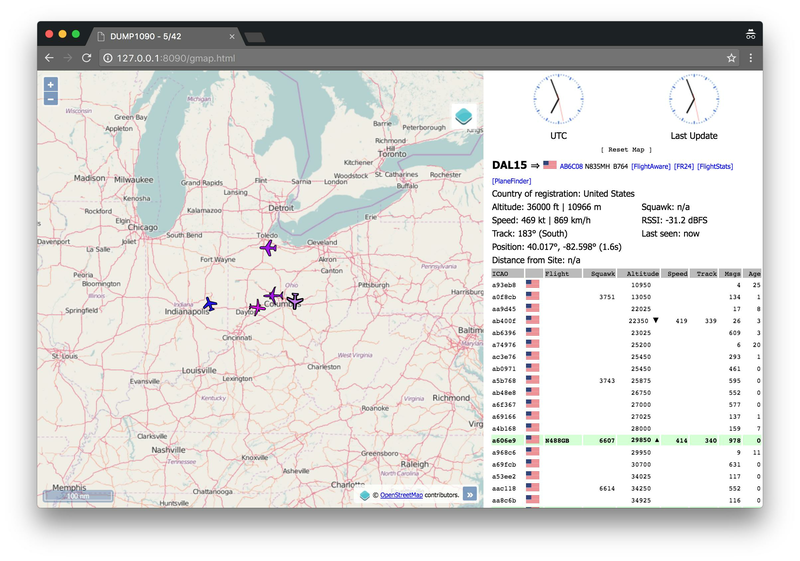 Here’s one way to receive, log, and real-time visualize the traffic on either of these ADS-B bands using a USB radio receiver and some open-source software on a Mac. Buy RTL-SDR. $25 kit on Amazon. Optional: buy antennas. $20 Stratux DMURRAY14 kit. If you’ve ever used the original dump1090 by @antirez: @mutability’s fork of dump1090 is architecturally different than the original. This fork writes a JSON file which has to be served by some external webserver. This uses Python2 to serve the current directory’s contents: browse to http://127.0.0.1:8090/gmap.html to see an OpenStreetMap. Now, an application like dump1090 or dump978 can put data inside this directory and the map will display it. Note that the Time field above corresponds to microseconds since the application started. This provides a simple way of timestamping each observation, assuming you can tell when the application started. Clone and build @mutability’s dump978 repository to collect general aviation beacons, which operate in the 978 MHz band. Don’t run this when in the same directory as dump1090—you almost never want a git repository inside another git repository. $ cp -r /PATH/TO/dump1090/public_html . The last two lines copy dump1090’s webapp to the dump978 directory and (re)creates a data/ subdirectory. Following the same process as dump1090, we can start a webserver using plain Python2. We will choose a different port to avoid conflicts with the dump1090 webapp. Open a browser tab to http://127.0.0.1:8978/gmap.html. Soon, you should start seeing GA traffic in the web browser. dump978’s uat2json will update the webapp’s data once a second. Beware: both browser windows (dump1090’s and dump978’s) will say “dump1090”, since we just copied dump1090’s webapp and are dumping 978 MHz data into it. The only difference is the port number in the URL.